Sturdy professional recumbent bike with inbuilt power generator, an easy-to-read display, comfortable seat and a number of programs. 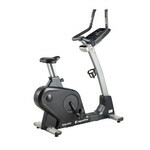 The Recumbent Exercise Bike inSPORTline Gemini R200 is a professional trainer perfect suitable for any fitness centre. Its sturdy frame ensures its stability and allows for the 140 kg weight limit. Aside from the fully electronic resistance regulation, you may also appreciate the 26 programs: 12 preset programs, 4 user programs, 4 HRC programs (resistance adjusts according to your heart rate), 3 target programs, a WATT program, Recovery program and a manual mode (which you can set to suit your needs). The Gemini R200 features an easy-to-read display which shows all the important information, such as calories burned, speed, revolutions per minute, distance, performance (WATT) and resistance level. On the back of the computer, you can find a USB input and two audio jacks (when you want to exercise with your headphones on or use the speakers). 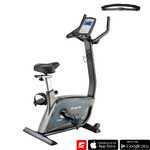 The Recumbent Exercise Bike inSPORTline Gemini R200 further features a comfortable and adjustable seat, handlebars with inbuilt heart rate sensors and control buttons, a tablet holder, and a bottle holder. Next to the control panel, there are two other handlebars that will helpyou to easily get-on/off the trainer. Transport wheels and a system to compensate for uneven floor are a given. 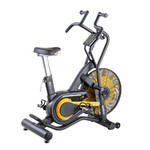 As the Recumbent Exercise Bike inSPORTline Gemini R200 features an inbuilt power generator with a battery (or you can use power cord), it does not need to be connected to a power source – all becessary energy is created by the exercise.You don't even need any power cables and/or extension cords. Since it saves energy, it is environment-friendly. The battery must not be left depleted for longer than 30 days. It must be charged by the generator at least once a month. The charging cycle is 6 hours.